CREATE was the first IVF clinic to make a commitment to Natural and Mild IVF in the world. Today, IVF success rates with Mild IVF at CREATE are excellent and with Natural Cycle IVF, we give options to those who would be turned away elsewhere. Our fertility treatments offer women the chance to have a baby using their own eggs, without the need for long and intense courses of stimulating drugs. Natural and Mild IVF work within a woman's natural cycle and focus on the quality of eggs and embryos, not the quantity. By using a tailored approach that focuses on quality and not quantity, Natural and Mild IVF offer an IVF experience that is aimed at protecting both the short and long-term health of mother and child. At CREATE Fertility, we advocate Natural and Mild IVF because they focus on the quality of eggs/embryos, not the quantity. There is considerable scientific evidence to show that embryos created from IVF cycles with lower doses of stimulating drugs are of higher quality than those produced in conventional IVF. In the study by Baart et al. embryos were created from Conventional and Mild IVF cycles. So on first glance, in terms of number of embryos, it appears that Conventional IVF is the better option. 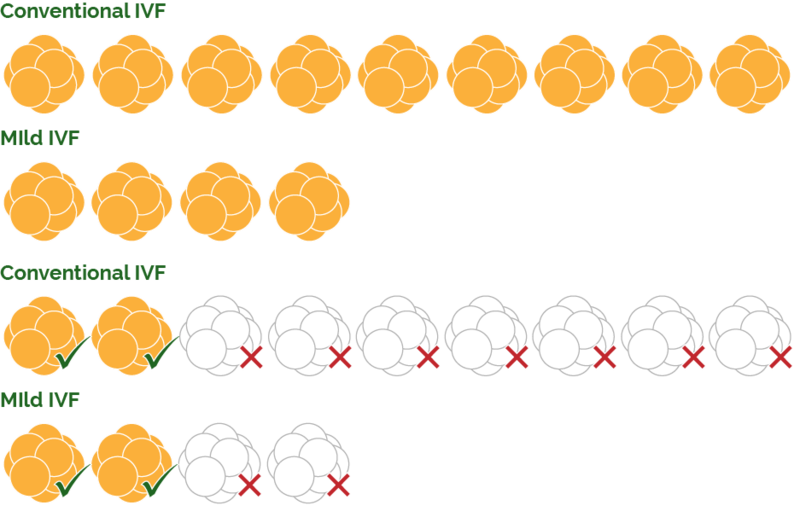 However, when the embryos are examined in more details for chromosomal problems (aneuploidy), a significantly higher percentage in a conventional, high stimulation IVF cycle are found to be chromosomally abnormal. All of the additional drugs, stress and costs were unnecessary; the same result could be achieved with Mild IVF. Vinod Nargund is a Consultant Urological Surgeon with an interest in Andrology. He has successfully led the andrology service for CREATE Fertility for the last 10 years. He deeply cares about using evidence-based care to help men improve their natural fertility where possible. He takes a holistic approach in helping men improve their sperm parameters. He is highly skilled in surgical sperm retrieval procedures including advanced testicular sperm collection using a microscope. His interest in male infertility originates from his expertise in the management of testicular cancer; he pioneered testis-conservation surgery along with Professor Tim Oliver, Emeritus Professor of Oncology. Vinod was trained in Urology Units at Belfast, Bradford and Oxford. Previously he was the Lead Cancer Surgeon at St Bartholomew’s Hospital and currently provides Andrology Service at Homerton University Hospital, London. Vinod has published over 70 scientific papers in national and international Urology journals. In addition to the research on surgical aspects in relation to male infertility his interests include the role of psychological stress in male infertility. Dr Bhattacharya had her basic MBBS training at the NRS Medical College in India and moved to the UK in 2002 for higher training in Obstetrics and Gynaecology. She was an Obstetrics and Gynaecology Trainee at the Severn and Peninsular Deanery. Whilst working in gynaecological cancer, she developed an interest in fertility preservation and began a special skills training course in fertility. After the completion of her training, instead of starting a consultant post, she decided to take up a fellowship in fertility at the IVF Unit in Derriford Hospital in Plymouth. She then worked as a Locum Consultant at the Fertility Unit at Barts Hospital after finishing her fellowship. Subsequently, she joined the Derriford Hospital as a Consultant in Obstetrics, Gynaecology and Reproductive medicine. After working in the NHS as a consultant for almost five years, she went on to join the CREATE Fertility team in 2017. She is excited to work in a unit which practices and advocates a more woman friendly approach to fertility treatment, focusing on the ‘quality not quantity’ of eggs and embryos. Dr Priyanka is a Consultant in Gynaecology, Reproductive Medicine and surgery. She qualified as a doctor in Obstetrics and Gynaecology in Pune India in 2002 and finished her Post Graduation in 2005. Subsequently she completed her specialist training in Obstetrics and Gynaecology in the East of England (Cambridge). During this period she gained broad clinical experience in general Obstetrics and Gynaecology and was awarded MUM award in November 2013 at the House of Lords for excellent management of a patient in labour. She went on to complete the Advanced Skills Training Modules (ATSMs) in Subfertility and Reproductive Endocrinology and Paediatrics and Adolescent Gynaecology. She also holds a diploma from the Faculty of Sexual and Reproductive Healthcare. Dr Priyanka obtained CCT from the East of England Deanery in 2014. She then did a fellowship in Assisted Conception at Guy’s and St Thomas’ Hospital for 2 years where she gained a wider and holistic experience in the speciality to provide and evidence based treatment. She has been certified by the British Fertility Society in Pelvic Ultrasound, Embryo Transfer and Intrauterine Insemination techniques, male infertility and management of infertile couples. She is a Member of the Royal College of Obstetricians and Gynaecologists (RCOG), the British Fertility Society (BFS) and European Society of Human Reproduction and Embryology (ESHRE). She has also been involved in various local, national and international presentations in societies like BSGE, ESGE,ESHRE. She has a special interest in assisted reproduction techniques, fertility preservation and management of women with low ovarian reserve. Dr Priyanka joined CREATE Fertility as she shares the belief that mild approach in IVF treatment results in better outcomes compared to traditional IVF. She believes in individualized tailored approach as well as providing high quality of care to optimize patient journey. Dr Larisa Corda is an IVF Doctor. She was born in Sarajevo, Former Yugoslavia, and came to live in the UK aged 7. She grew up in Leeds, before moving to London to complete her medical studies at Imperial College, gaining an MBBS and BSc in 2007. In 2010, she decided to specialise in Obstetrics and Gynaecology. Deciding to focus on fertility specifically, she worked in Sydney from 2012-2013, gaining experience with IVF Australia, and completing research that specifically examined the differences in demographics and IVF access amongst patients across Australia. She returned to the UK and obtained her MRCOG and further training in IVF. She joined the CREATE team in 2017 and her research interests have included investigating the inequity of access to reproductive healthcare, as well as the impact of emotional well-being on IVF. Dr Nirmal Felix completed her Bachelor of Medicine & Bachelor of Surgery (MBBS) in India with distinctions. She underwent postgraduate training in Obstetrics and Gynaecology training both in India and in the East Midlands deanery including Nottingham, Leicester and Chesterfield hospitals. She attained the membership of the Royal College of Obstetricians and Gynaecologists (MRCOG) in 2011. Subsequently, she gained more experience in assisted reproduction while working in a fertility unit in the Midlands where she was the Clinical IVF specialist and Recurrent Miscarriage Lead. She has completed British Fertility Society (BFS) modules on ultrasound and embryo transfer. Her special interests are reproductive immunology and endocrinology. She is a trainer for the West Midlands transvaginal scanning course. She is an active member of the British Fertility Society, European Society for Human Reproduction and Embryology and Royal College of Obstetricians and Gynaecologists. Dr Nirmal has always been praised about the extra mile she takes in the care of her patients. Impressed by the patient-centred approach of Natural and Mild IVF, she has joined CREATE and is passionate about offering this as a first choice for anyone who needs fertility treatment. Dr Himanshu Borase is a Consultant in Reproductive Medicine. After graduating in 2001, Dr Borase completed his post graduate diploma in obstetrics and gynaecology in Mumbai, India. Dr Borase came to the UK in 2005 and started his specialist fertility training in the Southwest of England when he gained wide experience in obstetrics and gynaecology, by working in different hospitals and with accomplished consultants. This training gave him with the knowledge and confidence in assisting patients with fertility issues and in performing surgical procedures. Dr Borase is a competent ultrasound scanner and likes to scan his own patients as this gives him all the required information to treat his patients effectively. Dr Borase finds it very important to take care and time with patients to discuss their individual needs and he uses his own illustrations to demonstrate particular treatment procedures. Dr Borase was recently nominated for the Patient’s Choice Award at Gloucestershire Royal Hospital. Dr Borase joined CREATE as he supports natural, mild and modified natural IVF as these treatments are more patient friendly, more in line with their physiology and bring down the risks associated with assisted conception treatments. Dr Peychinova joined CREATE fertility after she completed two years of training in Fetal Medicine at Kings College University Hospital. As a clinical research fellow, she participated in big research projects such as “ASPRE”: Aspirin for prevention of early preeclapsia, The role of the fetal fibronectin in prevention of the preterm delivery and many others. Before coming to the UK, Dr Ivanka Peychinova graduated with her medical degree in 2002 in Medical University of Plovdiv, and did 4 years of training in Contemporary Reproductive Techniques and IVF from 2011 to 2015, in Bulgaria. In 2007 she was recognized as a specialist in Obstetrics, Gynaecology and Reproductive Medicine from Medical University of Sofia. Her career in reproductive medicine began in 2009, when she went to work for University Hospital and IVF Centre SELENA, and did extensive training in Laparoscopies, hysteroscopies and other procedures related to infertility. Dr Peychinova joined CREATE fertility as she believes that the more natural approach which focuses on the quality of women’s eggs rather than the quantity, is the best approach to take to achieve a successful outcome. She is also a member of British Fertility Society, an associated member of Royal College of Obstetricians and Gynecologists. She has multiple qualifications in the Ultrasound in the Obstetrics and Gynecology, 3D & 4D Doppler and Transvaginal Sonography. Dr Nafee graduated from the Faculty of Medicine Alexandria University of Egypt in 1994. He completed his basic training in Obstetrics and Gynecology, and specialized training in Reproductive Medicine, while simultaneously researching ovulation and polycystic ovaries. He was awarded a Doctorate degree MD in 2010 for his work and attained the position of a clinical lecturer. Dr Nafee then moved to the UK, achieved membership of the Royal college of Obstetricians and Gynecologists MRCOG in 2008, and focused on the study of genomics and epigenetics. Dr Nafee was awarded his second Doctorate degree PhD from the University of Sheffield in 2016 for his work on microRNAs in embryo – endometrial communication at the time of embryo implantation. His special clinical interests include assisted conception, implantation failure, ovulation abnormalities and advanced reproductive ultrasonography. Dr Malamas is excited to have joined CREATE Fertility as he strongly believes in the advantages of a more physiological and more gentle approach to IVF, that is individually tailored to patients: reducing risks and promoting better outcomes for mothers and babies. Lamiya Mohiyiddeen is a consultant gynaecologist and subspecialist in Reproductive Medicine and Surgery. She has been a consultant in Reproductive Medicine and Gynaecology at St.Mary’s hospital since 2013. She is also an Honorary Senior Lecturer at the University of Manchester. Lamiya graduated from Manipal Academy of Higher Education in India in 2000. She has since completed her specialist training in obstetrics and gynaecology from the Northwestern Deanery, followed by subspecialist training in Reproductive Medicine at St.Mary’s hospital, Manchester. She completed her MD from the University of Manchester in 2013, researching in pharmacogenetics of patients undergoing IVF treatment. 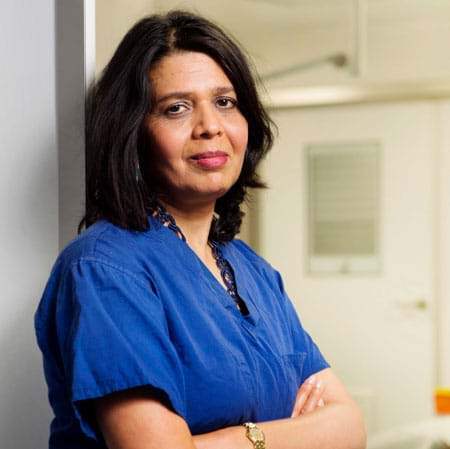 She is a member of Royal College of Obstetricians and Gynaecologists and other societies including British Fertility Society (BFS) and European Society of Human Reproduction and Embryology (ESHRE). Lamiya has clinical interests in the management of subfertility, assisted reproduction, outpatient hysteroscopy, hysteroscopic management of uterine anomalies and recurrent miscarriage. She is the lead for the recurrent miscarriage service at St.Mary’s hospital. Lamiya is the founder and convener of North of England Reproductive Medicine Group (NOERG) meetings. She has published widely both in journals and books. She has also recently jointly secured NIHR grant for endometrial scratch study. Her current research focuses on recurrent implantation failure, recurrent miscarriage and pharmacogenetics of IVF patients. Our consultants are at the heart of everything we do. We take pride in recruiting some of the top fertility experts. Our practice is based on scientific expertise and led by Professors Nargund, Campbell and Chian, who have pioneered many new innovations in fertility and IVF. These medical leaders train our team of doctors, who are highly experienced. Your treatment will be led throughout by our doctors, which differs from other clinics, where care is often led by the nursing team. At CREATE, we have spearheaded Natural and Mild IVF in the UK and we are very proud of the success rates we have achieved. We understand how important success rates can be when choosing a fertility clinic so it’s vitally important these are as accurate as possible. We strive to be open, transparent and honest about our results, for this reason we’ve included the latest HFEA verified data so you can be confident in our figures. Our Medical Director, Professor Geeta Nargund, has long been committed to finding ways to make IVF more affordable. From her early academic work studying how to improve the success of Natural Cycle IVF, she realised that the fertility drugs in conventional IVF contribute significantly to the cost of each treatment. Her work has therefore focused on making Natural and Mild IVF more successful, so that the cost would be more affordable. One of the major benefits of coming to CREATE Fertility for treatment is that there are no waiting lists. With treatment on the NHS involving long waiting lists, private treatment is often a more suitable option for those for whom time is running out. Typically patients on the NHS have to wait around 2 years after being approved for funding. At our clinics you do not have to wait at all, we will simply work within your natural cycle. Get in touch to talk to our friendly team of specialists or to book an appointment.